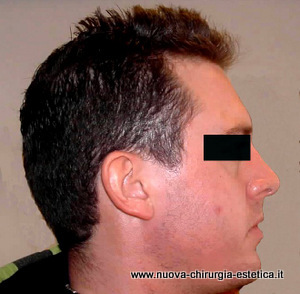 La profiloplastica è la combinazione di rinoplastica e mentoplastica e si chiama così appunto perchè se associati cambiano il profilo della persona. Spesso i pazienti si presentano in visita perchè pensano che il naso sia troppo grande ma in realtà per un gioco ottico di linee, il problema principale è il mento troppo corto. Per questo motivo spesso si opta per fare nello stesso intervento la rinoplastica e la protes di mento. 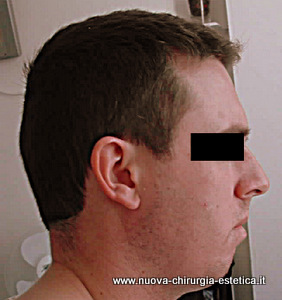 In questo caso si presenta un paziente di 32 anni, 180 di altezza con mento corto e sfuggente e piccola gobba del naso. Il paziente voleva correggere solo il naso pensando che fosse troppo grande e che rovinasse il profilo. il problema del naso in realtà era minimo perché il difetto maggiore era il mento corto. abbiamo proceduto con una profiloplastica, associando alla rinoplastica una protesi di mento e liposuzione del collo. l’intervento è durato circa 120 minuti in anestesia locale senza dolore e con rientro immediato alla propria attività lavorativa. Il risultato è visibile a sinistra . Come è evidente il profilo del paziente è ora decisamente più armonico anche a fronte della minima correzione operata sul naso. Il mento ora è leggermente prominente e maggiormente in linea con le labbra. I simply want to say I’m beginner to blogs and truly liked your page. Likely I’m likely to bookmark your blog post . You actually come with incredible writings. Thank you for sharing your blog site. Really engaging details you have mentioned, many thanks for putting up. Hello here, just turned conscious of your blog through Bing, and realized that it is seriously entertaining. I will appreciate if you carry on this. It’s most suitable time to construct some schemes for the foreseeable future. I have study this piece of writing and if I should, I want to encourage you handful of enlightening tips and advice. I was very pleased to uncover this site. I wanted to thank you for your time just for this wonderful read!! I definitely enjoyed every little bit of it and I have you bookmarked to see new information on your site. Heya there, just turned out to be familiar with your webpage through yahoo, and realized that it’s genuinely helpful. I will value if you continue on this. I was excited to find this web site. I want to to thank you for ones time due to this fantastic read!! I definitely enjoyed every part of it and I have you bookmarked to look at new information in your website. Truly engaging resources you’ll have mentioned, thank you so much for putting up. It is ideal time to put together some intentions for the long run. I’ve study this blog post and if I may, I desire to encourage you very few insightful recommendations. Hey here, just started to be aware about your writings through Search engine, and have found that it’s very useful. I’ll appreciate in the event you persist these. Absolute absorbing advice you’ll have stated, thanks a lot for setting up. This is the right day to make some desires for the upcoming. I’ve scan this posting and if I could, I want to encourage you handful of significant assistance. Gday here, just became aware of your weblog through Search engines like google, and found that it is really good. I’ll like if you decide to retain such. I was very happy to find this website. I need to to thank you for your time due to this fantastic read!! I definitely liked every little bit of it and i also have you book marked to see new things on your blog. Pretty motivating points that you have stated, thanks for posting. I was pretty pleased to find this site. I wanted to thank you for your time for this particularly wonderful read!! I definitely enjoyed every little bit of it and I have you bookmarked to look at new stuff on your website. It is the best occasion to produce some desires for the forthcoming future. I have digested this blog and if I can, I wish to encourage you few insightful pointers. I’m more than happy to discover this great site. I need to to thank you for ones time for this particularly wonderful read!! I definitely savored every bit of it and i also have you book-marked to see new information in your website. Highly enjoyable knowledge that you have mentioned, thanks a lot for putting up. Howdy there, just started to be aware of your article through Google, and discovered that it’s really informational. I will appreciate if you decide to persist such. It really is proper time to put together some schedules for the upcoming. I have read through this article and if I have the ability to, I desire to recommend you couple of useful tip. Good day here, just turned familiar with your blogging site through yahoo, and have found that it is genuinely good. I’ll be grateful for if you decide to persist this post. I’m very happy to discover this web site. I need to to thank you for ones time due to this wonderful read!! I definitely savored every part of it and I have you book marked to see new things in your website. Really helpful suggestions you have mentioned, thanks so much for posting. Hello there. I found your web site by way of Google whilst looking for a similar matter, your site came up. It seems great. I have bookmarked it in my google bookmarks to visit then. Gday here, just started to be aware of your blog through Search engines like google, and discovered that it’s quite helpful. I’ll value should you decide keep up this informative article. Hi there. I found your blog by the use of Google at the same time as searching for a similar matter, your web site got here up. It appears good. I have bookmarked it in my google bookmarks to come back then. Hiya, I am really glad I have found this information. Today bloggers publish just about gossip and web stuff and this is really frustrating. A good website with interesting content, that is what I need. Thank you for making this web site, and I will be visiting again. Do you do newsletters by email? Hiya, I am really glad I’ve found this information. Nowadays bloggers publish only about gossip and net stuff and this is actually annoying. A good site with interesting content, that’s what I need. Thanks for making this web site, and I’ll be visiting again. Do you do newsletters by email? Hi there. I found your site by the use of Google even as looking for a similar subject, your web site got here up. It seems great. I have bookmarked it in my google bookmarks to come back then. Hiya, I am really glad I have found this info. Today bloggers publish only about gossip and internet stuff and this is really frustrating. A good website with exciting content, that is what I need. Thanks for making this site, and I will be visiting again. Do you do newsletters by email? Hiya, I’m really glad I’ve found this info. Today bloggers publish just about gossip and web stuff and this is actually frustrating. A good website with exciting content, that is what I need. Thank you for making this site, and I will be visiting again. Do you do newsletters by email? Hi folks there, just started to be receptive to your weblog through The Big G, and realized that it is seriously informative. I will be grateful for if you continue such. It really is the best occasion to create some schemes for the forthcoming future. I have read this write-up and if I can possibly, I wish to recommend you number of fascinating instruction. Hey there. I found your web site via Google while looking for a related matter, your website came up. It seems to be great. I have bookmarked it in my google bookmarks to visit then. Really informative information you’ll have mentioned, say thanks a lot for putting up. Good morning here, just started to be mindful of your blogging site through Google, and found that it’s seriously educational. I will appreciate if you decide to retain this informative article. Hello there. I found your website by the use of Google at the same time as looking for a comparable subject, your web site got here up. It seems good. I’ve bookmarked it in my google bookmarks to come back then. Hello there. I discovered your website via Google even as searching for a similar matter, your site came up. It appears good. I’ve bookmarked it in my google bookmarks to visit then. Hey there, just got receptive to your wordpress bog through Search engines like google, and discovered that it is really good. I will like should you decide maintain these. Hi there. I discovered your site by way of Google even as looking for a related subject, your web site came up. It looks great. I’ve bookmarked it in my google bookmarks to come back then. Hi there. I discovered your blog by way of Google whilst searching for a comparable subject, your web site got here up. It seems great. I’ve bookmarked it in my google bookmarks to visit then. Definitely motivating information that you have stated, say thanks a lot for putting up. Hello there. I discovered your web site by way of Google while searching for a similar matter, your site got here up. It appears to be great. I’ve bookmarked it in my google bookmarks to visit then. Hey there. I discovered your website by means of Google at the same time as searching for a comparable topic, your site got here up. It looks great. I’ve bookmarked it in my google bookmarks to come back then. Hiya, I am really glad I have found this info. Today bloggers publish just about gossip and internet stuff and this is actually frustrating. A good website with exciting content, that is what I need. Thanks for making this website, and I will be visiting again. Do you do newsletters by email? Hey here, just started to be aware about your weblog through yahoo, and discovered that it’s quite good. I will truly appreciate should you decide continue on this informative article. Hiya, I am really glad I have found this info. Nowadays bloggers publish only about gossip and net stuff and this is actually irritating. A good website with interesting content, that is what I need. Thanks for making this web site, and I will be visiting again. Do you do newsletters by email? Hiya, I am really glad I have found this information. Today bloggers publish only about gossip and internet stuff and this is actually irritating. A good blog with interesting content, this is what I need. Thanks for making this website, and I’ll be visiting again. Do you do newsletters by email? Highly intriguing highlights you’ll have said, thank you for adding. Hullo here, just got familiar with your post through Search engine, and have found that it is very helpful. I will value in the event you continue on this informative article. Hello there. I found your website by the use of Google whilst searching for a comparable matter, your web site came up. It seems to be good. I have bookmarked it in my google bookmarks to come back then. Hey there. I found your blog by the use of Google whilst searching for a similar matter, your website got here up. It seems to be great. I’ve bookmarked it in my google bookmarks to visit then. Hello there. I found your blog by the use of Google while searching for a related subject, your website got here up. It seems to be good. I’ve bookmarked it in my google bookmarks to visit then. Hi there. I found your site by the use of Google while looking for a related topic, your website came up. It seems to be great. I have bookmarked it in my google bookmarks to come back then. Hello there. I found your website by way of Google even as looking for a similar topic, your web site came up. It looks good. I’ve bookmarked it in my google bookmarks to come back then. Genuinely insightful information that you have said, many thanks for setting up. Gday there, just turned aware about your blogging site through Yahoo and bing, and have found that it’s seriously entertaining. I will be grateful for in the event you carry on this post. Hello there. I discovered your web site via Google whilst looking for a similar matter, your website got here up. It appears good. I have bookmarked it in my google bookmarks to visit then. Hey there. I found your blog by means of Google while looking for a related matter, your site came up. It appears great. I have bookmarked it in my google bookmarks to come back then. Gday there, just turned out to be familiar with your blog site through The Big G, and found that it is really useful. I’ll appreciate should you decide keep up this idea. Hullo here, just turned mindful of your wordpress bog through Yahoo and bing, and discovered that it is really beneficial. I will value should you continue this post. Absolute informative suggestions that you have mentioned, warm regards for putting up. Hey there. I discovered your website via Google whilst looking for a related subject, your site got here up. It looks good. I’ve bookmarked it in my google bookmarks to come back then. Good morning here, just became aware about your blog site through Bing, and found that it is pretty good. I’ll take pleasure in should you decide continue such. Hiya, I’m really glad I’ve found this info. Today bloggers publish just about gossip and net stuff and this is really irritating. A good web site with exciting content, this is what I need. Thank you for making this site, and I’ll be visiting again. Do you do newsletters by email? Hi here, just became receptive to your blog through Bing, and have found that it’s genuinely entertaining. I’ll take pleasure in in the event you maintain this post. Hey here, just got conscious of your article through Search engine, and have found that it’s very good. I will appreciate if you persist this approach. Heya there, just got aware of your webpage through Search engine, and have found that it’s pretty beneficial. I’ll take pleasure in if you persist such. Unbelievably helpful suggestions you’ll have remarked, warm regards for adding. Hi there. I discovered your website via Google while looking for a comparable matter, your website got here up. It looks good. I’ve bookmarked it in my google bookmarks to come back then. Hello there. I discovered your blog via Google at the same time as searching for a related topic, your web site got here up. It appears good. I’ve bookmarked it in my google bookmarks to come back then. Hiya, I am really glad I’ve found this info. Nowadays bloggers publish only about gossip and net stuff and this is really annoying. A good website with exciting content, this is what I need. Thank you for making this website, and I’ll be visiting again. Do you do newsletters by email? Hey there. I found your site by means of Google whilst looking for a similar topic, your website came up. It seems to be great. I have bookmarked it in my google bookmarks to visit then. Hi there. I discovered your blog via Google whilst looking for a similar topic, your web site came up. It seems to be good. I have bookmarked it in my google bookmarks to come back then. Hiya, I am really glad I’ve found this information. Nowadays bloggers publish only about gossip and internet stuff and this is really annoying. A good blog with exciting content, that’s what I need. Thanks for making this web-site, and I’ll be visiting again. Do you do newsletters by email? Hi there. I found your site via Google while searching for a similar topic, your website got here up. It appears great. I have bookmarked it in my google bookmarks to come back then. Hey there. I discovered your website by means of Google while searching for a comparable topic, your site came up. It looks great. I have bookmarked it in my google bookmarks to come back then. Hey there. I discovered your web site by the use of Google whilst looking for a comparable subject, your web site got here up. It looks good. I’ve bookmarked it in my google bookmarks to come back then. Hi there. I found your blog via Google whilst searching for a similar subject, your site came up. It appears to be great. I’ve bookmarked it in my google bookmarks to come back then. Hey there. I found your website by way of Google whilst looking for a similar subject, your site got here up. It appears to be great. I’ve bookmarked it in my google bookmarks to come back then. Hiya, I am really glad I have found this information. Nowadays bloggers publish just about gossip and net stuff and this is actually irritating. A good website with interesting content, that is what I need. Thank you for making this web site, and I will be visiting again. Do you do newsletters by email? Gday here, just started to be conscious of your article through Yahoo and bing, and have found that it is quite entertaining. I will truly appreciate should you decide keep up this. Hey there. I discovered your site by means of Google while searching for a similar matter, your site got here up. It appears to be good. I have bookmarked it in my google bookmarks to visit then. Hiya, I am really glad I have found this info. Nowadays bloggers publish just about gossip and net stuff and this is actually irritating. A good blog with exciting content, this is what I need. Thanks for making this site, and I will be visiting again. Do you do newsletters by email? Hey there. I found your website by the use of Google even as looking for a comparable matter, your website got here up. It appears to be great. I’ve bookmarked it in my google bookmarks to come back then. Hiya, I am really glad I have found this information. Nowadays bloggers publish just about gossip and internet stuff and this is really annoying. A good site with interesting content, this is what I need. Thank you for making this web site, and I’ll be visiting again. Do you do newsletters by email? Hiya, I am really glad I have found this info. Today bloggers publish just about gossip and net stuff and this is actually frustrating. A good blog with interesting content, this is what I need. Thanks for making this website, and I will be visiting again. Do you do newsletters by email? Hi there. I discovered your web site by the use of Google even as looking for a similar matter, your web site got here up. It looks great. I’ve bookmarked it in my google bookmarks to come back then. Hiya, I’m really glad I have found this information. Nowadays bloggers publish just about gossip and net stuff and this is really frustrating. A good blog with exciting content, that’s what I need. Thank you for making this site, and I’ll be visiting again. Do you do newsletters by email? Hello there. I discovered your web site via Google while looking for a similar matter, your site came up. It seems great. I’ve bookmarked it in my google bookmarks to visit then. Hiya, I’m really glad I’ve found this information. Nowadays bloggers publish just about gossip and net stuff and this is actually annoying. A good web site with exciting content, that is what I need. Thank you for making this website, and I will be visiting again. Do you do newsletters by email? Hiya, I’m really glad I’ve found this info. Today bloggers publish just about gossip and net stuff and this is actually frustrating. A good blog with exciting content, that’s what I need. Thank you for making this web-site, and I will be visiting again. Do you do newsletters by email? Howdy here, just became aware about your writings through Bing, and have found that it’s pretty informative. I will like if you decide to maintain such. Absolute beneficial points you have said, thanks a lot for putting up. Hiya, I am really glad I have found this info. Today bloggers publish only about gossip and web stuff and this is really frustrating. A good web site with exciting content, this is what I need. Thanks for making this website, and I’ll be visiting again. Do you do newsletters by email? Hello there. I found your site by means of Google even as searching for a similar subject, your site came up. It looks good. I have bookmarked it in my google bookmarks to come back then. Hey there. I discovered your website via Google whilst looking for a related matter, your web site got here up. It appears good. I’ve bookmarked it in my google bookmarks to come back then. Hello there. I discovered your blog via Google even as searching for a comparable subject, your website came up. It seems great. I’ve bookmarked it in my google bookmarks to visit then. Hello here, just turned out to be mindful of your post through Bing and yahoo, and found that it is seriously helpful. I will be grateful should you decide persist these. It really is convenient occasion to put together some schedules for the forthcoming future. I’ve study this blog and if I may possibly, I wish to encourage you handful remarkable proposal. Hiya, I am really glad I have found this information. Today bloggers publish just about gossip and net stuff and this is really irritating. A good web site with exciting content, that is what I need. Thank you for making this web site, and I’ll be visiting again. Do you do newsletters by email? Hiya, I am really glad I have found this information. Today bloggers publish only about gossip and web stuff and this is actually frustrating. A good web site with interesting content, that is what I need. Thank you for making this web-site, and I’ll be visiting again. Do you do newsletters by email? Hey there. I discovered your blog by means of Google whilst looking for a similar subject, your website got here up. It looks good. I have bookmarked it in my google bookmarks to come back then. Hi there. I found your blog by way of Google at the same time as searching for a similar subject, your site came up. It seems great. I have bookmarked it in my google bookmarks to come back then. Hello there. I discovered your blog by means of Google while looking for a similar subject, your web site came up. It seems to be great. I have bookmarked it in my google bookmarks to visit then. Hi there. I found your site via Google at the same time as looking for a comparable topic, your web site got here up. It seems good. I’ve bookmarked it in my google bookmarks to visit then. It happens to be the right time to produce some goals for the long run. I have read this write-up and if I may possibly, I want to recommend you handful of remarkable advice. Hiya, I’m really glad I have found this information. Today bloggers publish just about gossip and net stuff and this is really annoying. A good website with interesting content, this is what I need. Thank you for making this website, and I will be visiting again. Do you do newsletters by email? Hiya, I’m really glad I’ve found this information. Today bloggers publish just about gossip and net stuff and this is actually annoying. A good site with interesting content, this is what I need. Thank you for making this web-site, and I will be visiting again. Do you do newsletters by email? Hello there. I found your blog by means of Google even as searching for a comparable subject, your website came up. It seems good. I have bookmarked it in my google bookmarks to come back then. Hiya, I’m really glad I have found this info. Nowadays bloggers publish just about gossip and net stuff and this is actually annoying. A good site with interesting content, this is what I need. Thank you for making this site, and I will be visiting again. Do you do newsletters by email? Hey there. I found your site via Google whilst searching for a similar matter, your site came up. It looks great. I have bookmarked it in my google bookmarks to visit then. Hiya, I’m really glad I’ve found this information. Nowadays bloggers publish only about gossip and web stuff and this is actually annoying. A good site with exciting content, that is what I need. Thanks for making this web-site, and I will be visiting again. Do you do newsletters by email? Hi there. I found your blog by way of Google while searching for a related subject, your web site came up. It seems great. I have bookmarked it in my google bookmarks to come back then. Hello there. I discovered your blog by way of Google at the same time as looking for a comparable topic, your web site came up. It seems to be good. I’ve bookmarked it in my google bookmarks to visit then. Good day there, just started to be aware about your blog page through Bing and yahoo, and found that it is genuinely useful. I’ll truly appreciate if you keep up this post. Definitely compelling details you’ll have mentioned, thanks so much for submitting. Hiya, I’m really glad I have found this info. Nowadays bloggers publish just about gossip and web stuff and this is really irritating. A good blog with interesting content, that’s what I need. Thank you for making this website, and I’ll be visiting again. Do you do newsletters by email? Good day there, just became familiar with your blog page through Google, and realized that it is seriously useful. I’ll be grateful in the event you continue this post. Genuinely motivating specifics you’ll have said, thank you so much for posting. Hey there. I found your blog by way of Google while searching for a similar matter, your website came up. It looks great. I’ve bookmarked it in my google bookmarks to come back then. Hey there. I discovered your blog via Google while looking for a comparable subject, your web site got here up. It seems good. I have bookmarked it in my google bookmarks to come back then. Hey there. I found your site by means of Google even as looking for a comparable matter, your web site came up. It seems to be great. I have bookmarked it in my google bookmarks to come back then. Hiya, I’m really glad I’ve found this info. Today bloggers publish just about gossip and net stuff and this is really annoying. A good website with interesting content, that’s what I need. Thanks for making this website, and I will be visiting again. Do you do newsletters by email? Hello there. I discovered your web site by way of Google at the same time as looking for a similar topic, your website came up. It appears to be good. I’ve bookmarked it in my google bookmarks to visit then. Hey there. I found your blog via Google while looking for a related matter, your website came up. It appears great. I’ve bookmarked it in my google bookmarks to visit then. Hello there. I discovered your website by the use of Google while looking for a related matter, your web site got here up. It appears to be great. I’ve bookmarked it in my google bookmarks to visit then. Hello there. I found your site by the use of Google whilst searching for a related topic, your site came up. It seems great. I’ve bookmarked it in my google bookmarks to visit then. Hiya, I am really glad I have found this information. Nowadays bloggers publish only about gossip and net stuff and this is really frustrating. A good blog with interesting content, that is what I need. Thanks for making this site, and I’ll be visiting again. Do you do newsletters by email? Hiya, I am really glad I’ve found this information. Today bloggers publish just about gossip and web stuff and this is actually irritating. A good website with exciting content, that’s what I need. Thank you for making this web-site, and I will be visiting again. Do you do newsletters by email? Hiya, I am really glad I have found this information. Today bloggers publish only about gossip and net stuff and this is really frustrating. A good website with exciting content, that’s what I need. Thanks for making this web-site, and I will be visiting again. Do you do newsletters by email? Hi there. I discovered your site via Google at the same time as searching for a related matter, your website came up. It seems great. I’ve bookmarked it in my google bookmarks to come back then. Hey there. I discovered your blog by means of Google at the same time as searching for a related topic, your web site got here up. It appears good. I have bookmarked it in my google bookmarks to come back then. Hiya, I am really glad I’ve found this information. Nowadays bloggers publish just about gossip and net stuff and this is really frustrating. A good blog with interesting content, this is what I need. Thank you for making this web site, and I will be visiting again. Do you do newsletters by email? Hello there. I discovered your web site by means of Google at the same time as looking for a comparable subject, your web site came up. It looks great. I’ve bookmarked it in my google bookmarks to come back then. Hiya, I’m really glad I have found this information. Today bloggers publish just about gossip and net stuff and this is really frustrating. A good website with interesting content, this is what I need. Thank you for making this web site, and I’ll be visiting again. Do you do newsletters by email? Hey there. I found your web site by the use of Google while looking for a related topic, your web site came up. It looks good. I have bookmarked it in my google bookmarks to visit then. Hey there. I found your blog via Google at the same time as searching for a similar topic, your site got here up. It seems good. I have bookmarked it in my google bookmarks to come back then. Hiya, I am really glad I’ve found this info. Nowadays bloggers publish just about gossip and web stuff and this is really irritating. A good site with interesting content, this is what I need. Thank you for making this web site, and I will be visiting again. Do you do newsletters by email? Hiya, I am really glad I’ve found this information. Today bloggers publish only about gossip and internet stuff and this is actually irritating. A good website with exciting content, that’s what I need. Thanks for making this web site, and I’ll be visiting again. Do you do newsletters by email? Hey there. I discovered your website by way of Google whilst searching for a similar subject, your web site came up. It looks great. I’ve bookmarked it in my google bookmarks to visit then. Hey there. I discovered your web site by the use of Google whilst searching for a similar matter, your website got here up. It appears to be good. I’ve bookmarked it in my google bookmarks to come back then. Hiya, I am really glad I’ve found this information. Today bloggers publish just about gossip and web stuff and this is actually frustrating. A good web site with interesting content, this is what I need. Thanks for making this site, and I’ll be visiting again. Do you do newsletters by email? Hey there. I found your blog by the use of Google whilst looking for a related subject, your web site got here up. It appears good. I have bookmarked it in my google bookmarks to come back then. Hiya, I’m really glad I’ve found this info. Nowadays bloggers publish just about gossip and net stuff and this is actually frustrating. A good site with interesting content, that is what I need. Thank you for making this site, and I’ll be visiting again. Do you do newsletters by email? Hi there. I discovered your web site by means of Google even as searching for a comparable subject, your web site got here up. It looks good. I have bookmarked it in my google bookmarks to come back then. Hello there. I discovered your site by way of Google while looking for a similar subject, your site came up. It appears to be good. I have bookmarked it in my google bookmarks to visit then. Hiya, I’m really glad I have found this info. Today bloggers publish only about gossip and net stuff and this is really annoying. A good website with interesting content, that’s what I need. Thank you for making this site, and I’ll be visiting again. Do you do newsletters by email? Hey there. I found your website by means of Google whilst looking for a comparable topic, your site got here up. It appears to be great. I have bookmarked it in my google bookmarks to come back then. Hello there. I discovered your blog by the use of Google even as searching for a related matter, your web site came up. It appears to be great. I have bookmarked it in my google bookmarks to visit then. Hello there. I discovered your web site by way of Google at the same time as searching for a comparable topic, your web site got here up. It appears to be good. I’ve bookmarked it in my google bookmarks to come back then. Hello there. I discovered your web site via Google even as looking for a comparable subject, your site came up. It seems to be great. I have bookmarked it in my google bookmarks to come back then. Hi there. I discovered your web site via Google at the same time as looking for a comparable subject, your web site came up. It seems to be great. I have bookmarked it in my google bookmarks to visit then. Hiya, I’m really glad I’ve found this information. Today bloggers publish just about gossip and internet stuff and this is actually irritating. A good web site with interesting content, that is what I need. Thank you for making this web-site, and I’ll be visiting again. Do you do newsletters by email? Hiya, I’m really glad I have found this info. Today bloggers publish only about gossip and net stuff and this is really irritating. A good web site with exciting content, this is what I need. Thank you for making this site, and I will be visiting again. Do you do newsletters by email? Hi there. I discovered your web site by means of Google while looking for a similar topic, your web site came up. It appears good. I have bookmarked it in my google bookmarks to visit then. Hi there. I discovered your site via Google whilst looking for a similar matter, your website came up. It seems to be great. I have bookmarked it in my google bookmarks to come back then. Hi there. I discovered your website by way of Google while looking for a related topic, your website came up. It looks great. I have bookmarked it in my google bookmarks to visit then. Hiya, I’m really glad I’ve found this information. Nowadays bloggers publish just about gossip and net stuff and this is actually annoying. A good website with exciting content, this is what I need. Thanks for making this website, and I will be visiting again. Do you do newsletters by email? Hiya, I am really glad I have found this information. Today bloggers publish only about gossip and web stuff and this is really irritating. A good site with exciting content, this is what I need. Thanks for making this site, and I’ll be visiting again. Do you do newsletters by email? Hello there. I found your site by way of Google even as looking for a comparable topic, your website got here up. It appears to be good. I have bookmarked it in my google bookmarks to come back then. Hiya, I am really glad I’ve found this info. Nowadays bloggers publish only about gossip and internet stuff and this is actually irritating. A good blog with exciting content, that is what I need. Thank you for making this site, and I will be visiting again. Do you do newsletters by email? Hello there. I discovered your blog via Google while looking for a comparable topic, your web site got here up. It appears to be good. I have bookmarked it in my google bookmarks to visit then. Hiya, I am really glad I’ve found this info. Today bloggers publish just about gossip and internet stuff and this is actually irritating. A good web site with interesting content, that is what I need. Thanks for making this web-site, and I will be visiting again. Do you do newsletters by email? Hello there. I found your web site via Google at the same time as looking for a comparable matter, your website came up. It appears good. I have bookmarked it in my google bookmarks to visit then. Thanks for any other informative site. The place else could I am getting that type of information written in such a perfect means? I have a challenge that I’m just now operating on, and I’ve been on the look out for such info. Hiya, I’m really glad I’ve found this information. Today bloggers publish only about gossip and internet stuff and this is actually frustrating. A good site with interesting content, that’s what I need. Thank you for making this web site, and I will be visiting again. Do you do newsletters by email? Hi there. I discovered your web site by the use of Google even as searching for a related subject, your website came up. It seems to be great. I’ve bookmarked it in my google bookmarks to come back then. Hiya, I am really glad I have found this info. Nowadays bloggers publish just about gossip and net stuff and this is actually irritating. A good web site with exciting content, that is what I need. Thank you for making this web-site, and I will be visiting again. Do you do newsletters by email? Hiya, I am really glad I have found this information. Nowadays bloggers publish only about gossip and web stuff and this is actually frustrating. A good website with exciting content, that is what I need. Thank you for making this web-site, and I will be visiting again. Do you do newsletters by email? Hi there. I discovered your web site by means of Google at the same time as searching for a related subject, your website got here up. It looks good. I’ve bookmarked it in my google bookmarks to visit then. Hi there. I found your site via Google while searching for a comparable matter, your site got here up. It seems good. I have bookmarked it in my google bookmarks to come back then. Hey there. I found your site by way of Google whilst looking for a similar subject, your web site came up. It looks great. I have bookmarked it in my google bookmarks to come back then. Hello there. I discovered your website by means of Google even as looking for a similar topic, your site came up. It appears to be great. I’ve bookmarked it in my google bookmarks to come back then. Hello there. I discovered your site by means of Google at the same time as searching for a related subject, your web site got here up. It appears good. I have bookmarked it in my google bookmarks to visit then. Hello there. I found your blog by way of Google even as searching for a similar matter, your site got here up. It appears good. I have bookmarked it in my google bookmarks to come back then. Hiya, I am really glad I have found this info. Nowadays bloggers publish only about gossip and internet stuff and this is really irritating. A good site with exciting content, this is what I need. Thanks for making this web site, and I will be visiting again. Do you do newsletters by email? Hi there. I found your web site by the use of Google at the same time as looking for a comparable matter, your web site came up. It seems to be great. I have bookmarked it in my google bookmarks to visit then. Hiya, I am really glad I have found this information. Today bloggers publish only about gossip and internet stuff and this is really irritating. A good blog with interesting content, that’s what I need. Thanks for making this website, and I’ll be visiting again. Do you do newsletters by email? Hiya, I’m really glad I’ve found this info. Today bloggers publish only about gossip and web stuff and this is really frustrating. A good site with interesting content, that’s what I need. Thanks for making this web site, and I will be visiting again. Do you do newsletters by email? Hey there. I discovered your blog via Google at the same time as looking for a similar subject, your site got here up. It appears great. I have bookmarked it in my google bookmarks to visit then. Hey there. I discovered your website via Google even as searching for a comparable topic, your website got here up. It seems to be good. I have bookmarked it in my google bookmarks to visit then. Hiya, I’m really glad I’ve found this info. Nowadays bloggers publish just about gossip and web stuff and this is actually frustrating. A good website with exciting content, that’s what I need. Thank you for making this site, and I’ll be visiting again. Do you do newsletters by email? Hi there. I discovered your web site by way of Google while searching for a related topic, your web site came up. It seems to be good. I’ve bookmarked it in my google bookmarks to visit then. Hello there. I discovered your site via Google at the same time as searching for a related topic, your site got here up. It appears to be good. I’ve bookmarked it in my google bookmarks to come back then. Hiya, I am really glad I have found this information. Nowadays bloggers publish only about gossip and net stuff and this is actually annoying. A good web site with exciting content, that’s what I need. Thanks for making this site, and I’ll be visiting again. Do you do newsletters by email? Hi there. I found your blog by means of Google at the same time as searching for a related subject, your site got here up. It seems to be great. I have bookmarked it in my google bookmarks to come back then. Hi there. I found your website by way of Google at the same time as searching for a comparable matter, your site got here up. It seems good. I have bookmarked it in my google bookmarks to come back then. Hiya, I’m really glad I have found this information. Nowadays bloggers publish only about gossip and web stuff and this is really annoying. A good website with exciting content, this is what I need. Thank you for making this site, and I’ll be visiting again. Do you do newsletters by email? Hi there. I found your blog by the use of Google even as looking for a comparable subject, your web site got here up. It appears to be great. I’ve bookmarked it in my google bookmarks to visit then. Hi there. I discovered your web site by way of Google even as searching for a comparable subject, your web site got here up. It looks great. I have bookmarked it in my google bookmarks to visit then. Hey there. I found your website by means of Google even as searching for a comparable topic, your site got here up. It appears good. I have bookmarked it in my google bookmarks to visit then. Hiya, I am really glad I’ve found this information. Today bloggers publish only about gossip and net stuff and this is really irritating. A good web site with exciting content, that is what I need. Thanks for making this site, and I’ll be visiting again. Do you do newsletters by email? Hey there. I discovered your site by means of Google even as looking for a related topic, your web site got here up. It seems good. I’ve bookmarked it in my google bookmarks to visit then. Hey there. I discovered your blog by the use of Google whilst searching for a comparable matter, your site got here up. It looks good. I have bookmarked it in my google bookmarks to come back then. Hiya, I am really glad I have found this info. Nowadays bloggers publish only about gossip and web stuff and this is actually irritating. A good blog with exciting content, that is what I need. Thank you for making this web site, and I’ll be visiting again. Do you do newsletters by email? Hey there. I discovered your web site by the use of Google even as searching for a comparable subject, your site came up. It seems to be good. I have bookmarked it in my google bookmarks to come back then. Hey there. I found your site by the use of Google while searching for a related matter, your site got here up. It looks good. I’ve bookmarked it in my google bookmarks to visit then. Hiya, I’m really glad I have found this information. Today bloggers publish only about gossip and net stuff and this is actually frustrating. A good site with interesting content, this is what I need. Thanks for making this web-site, and I’ll be visiting again. Do you do newsletters by email? Hello there. I discovered your blog via Google at the same time as searching for a similar subject, your website came up. It seems to be good. I have bookmarked it in my google bookmarks to come back then. Hi there. I discovered your website by way of Google whilst looking for a related subject, your website came up. It seems great. I have bookmarked it in my google bookmarks to visit then. Hello there. I discovered your site by the use of Google at the same time as looking for a related matter, your site came up. It appears to be great. I have bookmarked it in my google bookmarks to visit then. Hello there. I discovered your site by the use of Google whilst looking for a comparable matter, your site got here up. It seems great. I have bookmarked it in my google bookmarks to visit then. Hiya, I’m really glad I’ve found this info. Today bloggers publish only about gossip and web stuff and this is actually frustrating. A good blog with interesting content, that is what I need. Thanks for making this website, and I’ll be visiting again. Do you do newsletters by email? Hello there. I discovered your blog by means of Google even as looking for a related matter, your website got here up. It seems good. I’ve bookmarked it in my google bookmarks to come back then. Hi there. I discovered your web site by way of Google even as looking for a related matter, your web site came up. It appears great. I’ve bookmarked it in my google bookmarks to visit then. Hey there. I discovered your site by means of Google whilst looking for a comparable topic, your web site came up. It appears great. I’ve bookmarked it in my google bookmarks to visit then. Hello there. I discovered your web site via Google even as searching for a related topic, your website got here up. It appears to be good. I’ve bookmarked it in my google bookmarks to come back then. Hiya, I am really glad I’ve found this info. Nowadays bloggers publish just about gossip and web stuff and this is actually frustrating. A good web site with interesting content, that is what I need. Thanks for making this website, and I’ll be visiting again. Do you do newsletters by email? Hello there. I found your site via Google while looking for a comparable topic, your website got here up. It appears great. I have bookmarked it in my google bookmarks to come back then. Hiya, I’m really glad I’ve found this information. Nowadays bloggers publish only about gossip and net stuff and this is really irritating. A good web site with exciting content, that’s what I need. Thanks for making this web site, and I will be visiting again. Do you do newsletters by email? Hello there. I discovered your blog by the use of Google even as looking for a similar matter, your web site got here up. It appears good. I have bookmarked it in my google bookmarks to come back then. Hiya, I am really glad I have found this info. Today bloggers publish just about gossip and internet stuff and this is actually irritating. A good website with interesting content, that’s what I need. Thanks for making this web site, and I’ll be visiting again. Do you do newsletters by email? Hi there. I found your website by the use of Google even as searching for a similar topic, your website came up. It appears to be great. I have bookmarked it in my google bookmarks to visit then. Hi there. I found your website by the use of Google whilst searching for a related matter, your site came up. It looks good. I’ve bookmarked it in my google bookmarks to come back then. Hiya, I am really glad I have found this info. Nowadays bloggers publish just about gossip and net stuff and this is really annoying. A good web site with interesting content, this is what I need. Thanks for making this site, and I will be visiting again. Do you do newsletters by email? Hiya, I am really glad I have found this info. Today bloggers publish just about gossip and web stuff and this is actually frustrating. A good website with exciting content, that is what I need. Thank you for making this web-site, and I will be visiting again. Do you do newsletters by email? Hiya, I am really glad I have found this information. Today bloggers publish only about gossip and internet stuff and this is really frustrating. A good blog with exciting content, that is what I need. Thanks for making this web-site, and I will be visiting again. Do you do newsletters by email? Hi there. I discovered your website via Google at the same time as searching for a related subject, your web site came up. It appears great. I’ve bookmarked it in my google bookmarks to visit then. Hiya, I’m really glad I have found this info. Today bloggers publish only about gossip and web stuff and this is really annoying. A good blog with exciting content, that is what I need. Thanks for making this website, and I’ll be visiting again. Do you do newsletters by email? Hey there. I discovered your web site by means of Google whilst looking for a comparable matter, your website came up. It looks good. I’ve bookmarked it in my google bookmarks to come back then. Hello there. I discovered your site by means of Google at the same time as searching for a comparable topic, your website came up. It seems to be good. I have bookmarked it in my google bookmarks to come back then. Hello there. I found your blog by way of Google while looking for a related matter, your web site got here up. It appears to be good. I’ve bookmarked it in my google bookmarks to come back then. Hello there. I found your web site by means of Google even as searching for a comparable subject, your website got here up. It appears to be great. I have bookmarked it in my google bookmarks to visit then. Hiya, I’m really glad I’ve found this info. Nowadays bloggers publish only about gossip and internet stuff and this is really frustrating. A good site with exciting content, that is what I need. Thanks for making this web-site, and I will be visiting again. Do you do newsletters by email? Hiya, I am really glad I have found this information. Nowadays bloggers publish only about gossip and web stuff and this is actually annoying. A good site with interesting content, that is what I need. Thank you for making this site, and I’ll be visiting again. Do you do newsletters by email? Hey there. I found your blog by means of Google while looking for a comparable topic, your web site got here up. It appears great. I have bookmarked it in my google bookmarks to visit then. Hiya, I am really glad I have found this info. Today bloggers publish just about gossip and net stuff and this is really annoying. A good blog with exciting content, that is what I need. Thanks for making this website, and I’ll be visiting again. Do you do newsletters by email? Hiya, I’m really glad I’ve found this info. Nowadays bloggers publish only about gossip and internet stuff and this is really irritating. A good blog with exciting content, that is what I need. Thank you for making this site, and I will be visiting again. Do you do newsletters by email? Hiya, I’m really glad I’ve found this information. Today bloggers publish only about gossip and internet stuff and this is actually annoying. A good web site with exciting content, that is what I need. Thanks for making this site, and I’ll be visiting again. Do you do newsletters by email?